Greentherm are a leading supplier and installer of tailored and customised underfloor heating systems in Ireland. Greentherm underfloor heating systems are designed to the highest standards, for maximum responsiveness and control in variable weather. In order to maintain a competitive price point and ensure quality, Greentherm sources and import material directly from European manufacturers. Our two principle suppliers are Italian manufacturer RBM for conventional screeded and acoustic under floor heating systems and Swedish manufacturer Floore for low build EPS panel solutions for joisted floor build ups. Both product suppliers provide solutions for residential and commercial applications. In general, an underfloor heating system replaces the radiators in a room. It consists of a loop of water-filled pipe, laid on top of a layer of thermal insulation, before being covered in a layer of liquid screed. A thermostat in the room automatically controls the flow of hot water through the underfloor loop, through an electrically-controlled valve. Each room in a home can have it’s own individual thermostat and underfloor heating loop, allowing each location to be independantly controlled. These form the heating ‘zones’. Each zone is then fed back to a main manifold, where the system control centre is fitted. Heating water is supplied to the manifold, made up of a series of automatic valves. This manifold is supplied with hot water from whatever heating source is installed in the house. 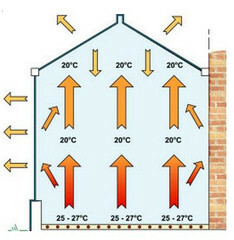 This can be a simple boiler, or a heat-pump and buffer store. As soon it is warmer than the temperature of the air in the room, the floor surface begins to radiate heat into the room. A specialised lightweight floor screed heats up faster, allowing for better control and a quicker response from the heating system, while still providing even heating. Radiant energy from the floor is either absorbed by the surfaces of the room and its contents, or reflected. As these other surfaces absorb energy, they warm up and become secondary emitters. Gradually, you become surrounded by gently radiating surfaces – something humans naturally find very comfortable. The air in the room only becomes warm by being in contact with these warming surfaces. With under floor heating, the room heats the air. As heat tends to rise, there is very little difference in air temperature within the room. Any radiant energy that strikes the windows tends to be reflected back into the room. Very little is absorbed by the glass and conducted outside. This leads to a very comfortable, even temperature throughout the room, controlled directly by a wall mounted thermostat. Under floor heating provides evenly distributed radiant heat ensuring controllable heat, everywhere at the right temperature. Underfloor heating systems can operate at much lower temperatures than conventional radiators, requiring less heat input to achieve these temperatures, making them much more efficient than radiator-based heating systems. Less heat, means less fuel, means less money spent. Greentherm underfloor heating systems are compatible with any source of heat, from a conventional gas boiler, to heat pumps, to solar thermal or solid fuel/biomass, or any combination of the above. A dedicated thermal store allows these systems to be combined together for the most efficient mix of fuels. Individual networked thermostats ensure easy, efficient control of your system, with settings tailored to match the changing daily dynamics of your home or offices. Rooms that are unoccupied during the day or night do not have to be heated. Each thermostat is located in the room it controls. This ensures that each room is heated only as much as is required to reach it’s desired temperature. The control system pulls it up to temperature, rather than an uncontrolled push. No wall-space need be given over to bulky radiators, allowing for clean, clear walls to be fitted out or decorated as you please. Your underfloor heating system will be a part of your building for decades to come, adapting to changes in your lifestyle as they happen. We at Greentherm have a pool of hard won experience in underfloor heating installation. We have learned how things work, and how to do them right, to build a system that will last, year in and year out. In our experience, the most expensive systems often turn out to have the cheapest sticker prices. You cannot afford to install a cheap, substandard system, not when it will be a part of your home for decades to come. Contact us now to arrange a no-obligation consultation, or for more information on Greentherm Underfloor heating. We’re always happy to talk to you. Call us on 00353-(0)1-5314781.